This dialog box lets you adjust the Onion Skin and Light table transparency parameters. In the Drawing view toolbar, click on the Top Light button to open the Onion Skin and Light Table Transparency dialog box. Sets the maximum opacity value for the onion skin opacity display. Moving the slider all the way to the left = 0% opacity. Moving the slider all the way to the right = 100% opacity. Sets the maximum opacity value for the light table display. Moving the slider all the way to the left = 0% opacity. Moving the slider all the way to the right = 100% opacity. Sets the washed-out value for the light table display. Moving the slider all the way to the left = 0% opacity. Moving the slider all the way to the right = 100% opacity. 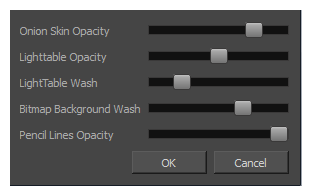 Sets the maximum opacity value for the background wash. Moving the slider all the way to the left = 0% opacity. Moving the slider all the way to the right = 100% opacity. Only works for bitmap layers. Sets the maximum opacity value for central vector lines (lines made by the Pencil or Shape tools). Moving the slider all the way to the left = 0% opacity. Moving the slider all the way to the right = 100% opacity.